With a clear and detailed approach to the fundamentals of statistical theory, Examples and Problems in Mathematical Statistics uniquely bridges the gap between theory andapplication and presents numerous problem-solving examples that illustrate the relatednotations and proven results. 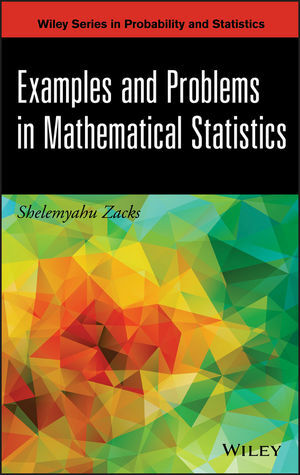 Recommended for graduate-level courses in probability and statistical inference, Examples and Problems in Mathematical Statistics is also an ideal reference for applied statisticians and researchers. SHELEMYAHU ZACKS, PhD, is Distinguished Professor in the Department of Mathematical Sciences at Binghamton University. He has published several books and more than 170 journal articles on the design and analysis of experiments, statistical control of stochastic processes, statistical decision theory, sequential analysis, reliability, statistical methods in logistics, and sampling from finite populations. A Fellow of the American Statistical Association, Institute of Mathematical Sciences, and American Association for the Advancement of Sciences, Dr. Zacks is the author of Stage-Wise Adaptive Designs, also published by Wiley.